If you follow me on instagram you already know that my husband presented me with a cookie challenge back in November. Thanksgiving weekend, I was making my Holiday to do list making sure we made time for holiday baking. I asked him what cookies he wanted me to bake and by that I meant what cookies do you have to for Christmas. You know those cookies that your grandma always made or you always had as kid that really just mean Christmas to you. So he tells me that he loved these cookies his German Grandma made when he was a kid. I didn't have much to go on and he did not have a name for the cookie only what they looked like and what was in the cookie. So off to Pinterest and Google I went and 15 min later I came back with several images that I pinned. So after his review of what he felt was close to the cookie he was talking about I added the cookie to the holiday baking list. But before that happened he tagged his comment about the cookies with "You will never be able to make them" hmm? Did I just hear you right? I will not be able to make them right? Oh game on! He pretty much just meant that I would never be able to duplicate his Grandmas exact cookie. Well I kinda figured that since I did not have her exact recipe but I was going to try my hardest to come close. Well, I came close ..... like lets say 99% close and I'll take that as a win! The cookies were a hit and will definitely be on the Holiday Cookie list next year! What Christmas cookies are always must haves in your house for the holidays? The recipe below is one I found on American Heritage Cooking and the only change I made was I used powdered sugar after the cookies came out of the oven. 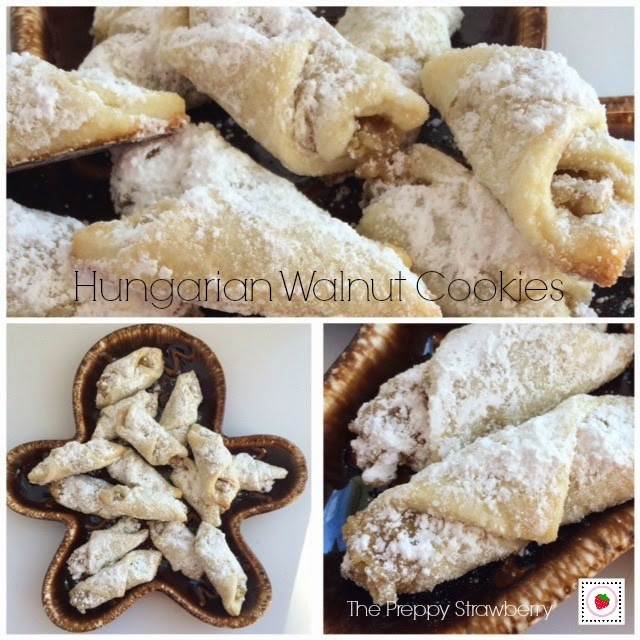 These traditional Hungarian cookies have a sweet, nutty filling inside a flakey, rich pastry! While they are traditionally made at Christmastime, they are outstanding any time of year! Mix filling in a medium bowl using only ¼ cup of the boiled milk. The mixture should be thick. If the filling is not spreadable, use the rest of the milk. I used all of it. It will thicken as it sits. Take one of the disks of dough from the refrigerator and lightly flour both sides. Spread granulated sugar on your pastry board or work surface. Place the dough on top and roll out pastry to 1/16” thick or as thin as possible. Most recipes say 1/8” but my Husband remembered them being thinner. Thinner is better. If you roll them too thick, the bottom will burn before the inside has a chance to fully cook and puff up. They still taste good but they taste so much better when properly rolled. Promise. Just trust me here. With a pastry wheel or sharp knife, trim the dough into a square and then cut the square into 16 smaller squares. My dough never rolled out into a perfect circle so I would just cut as many 1 1/2 “ squares a possible, saving the scraps for later. Place a dollop of filling in one corner of each square. I used ½ teaspoon. Starting in the corner with the filling, roll the dough around the filling from corner to corner, gently pressing down as you roll. Grab the roll on both sides and pinch as you bend the roll to create a crescent shape. Gently move it to a parchment covered baking sheet, placing the Rolls no closer than 1” apart. Repeat with all remaining squares. Sprinkle the middles of the Rolls with just a touch of granulated sugar. Bake 12-14 minutes or until the bottom edges are a golden and you can smell them. They should puff up slightly in the middle. With experience you can see when the dough is cooked. Let cool slightly on the pan on a wire rack and then move them gently to a wire rack to cool completely. Repeat with all remaining dough. Refrigerate and re-roll your scraps. Amazing. For a more traditional cookie, you can omit the granulated sugar and dust the final, cooled cookie with powdered sugar. I will warn you that it won’t be as divine.